Whatever it is ... State Industries is a worldwide supplier and manufacturer of premier cast-polyurethane products for over 40 years. Every grommet is custom made to your specifications, including size, material, and quantity. We fabricate grommets for any application you might have. 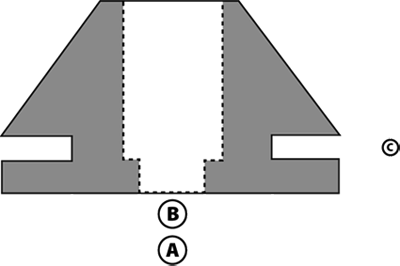 Refer to the diagram above, and take precise measurements of the grommet (in MM or inches.) Make sure and specify dimensions A, B, and C.
Provide us with the measurements of the grommet as per above. Advise us of the quantity you are looking for. We will provide you with a quote that specifies the exact measurements, durometer, and quantity of grommets you require. Once the quote is accepted, we will provide you with several sample grommets for your evaluation. Your grommet will be added to our production process, and a delivery date will be determined at the time of your order. Hardness of polyurethane is determined by “durometer.” This instrument measures resistance to penetration of an indenter point onto the polyurethane surface. A pointer moves across the scale to show the resistance to penetration. The “D” scale for harder materials.  An example of durometer measurements is shown in the chart below.